I’m going to start with a recap of what I talked about in the previous post. Then, I’m going to show how to mathematically represent Bayesian networks and make inferences about the states of its nodes. Reading two of my previous posts would be very helpful along the way, especially if you’re new to the topic. In the Calculating Compound Event Probabilities post (specifically, the “General formulas for compound events” section) you’ll find the derivation of the formula for the joint probability distribution of multiple events (which I’m going to use here). 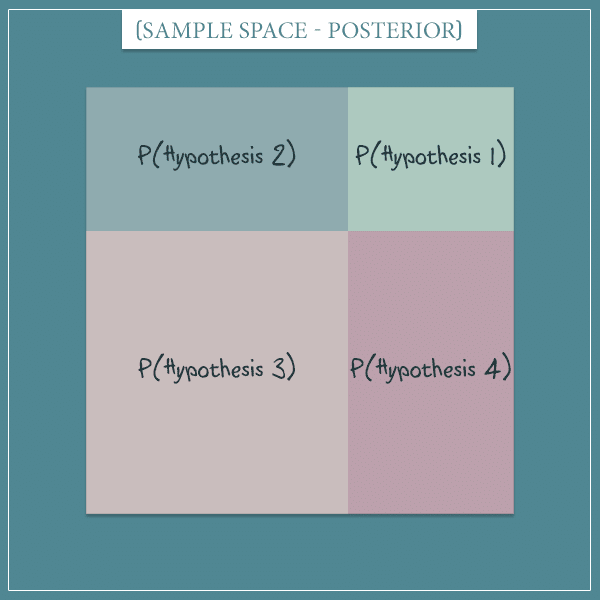 The post The Anatomy Of Bayes’ Theorem gives a really good intuition about the way an observation updates the probabilities of rival hypotheses that try to explain it. I specifically recommend the section explaining the evidence term of Bayes’ theorem because I’m going to use a very similar method in explaining the math of information propagation in Bayesian networks. Bayesian networks consist of nodes connected by arrows. You usually graphically illustrate the nodes as circles. Each node represents the probability distribution of a set of mutually exclusive outcomes. For example, a node can represent the outcome of rolling a die, with each side having a probability of 1/6 to be on top. Or the outcome of flipping of a coin, with each side having a probability of 1/2. More generally, each node represents the possible states of a variable and holds their respective probabilities. The arrows hold the information about the conditional probabilities between the nodes they connect. The node the arrow is pointing to (the child node) depends on the arrow it originates from (the parent node). This means that the probability of a child node taking a particular state will depend on the state of its parent. This simply reflects the fact that once you’ve observed a node, there’s no longer uncertainty about which state it’s in. P(Node 2 = State X | Node 1 = State Y). In other words, this is the probability of Node 2 being in State X, if Node 1 is State Y. By the way, this dependence between nodes is precisely what allows information propagation within Bayesian networks. Observing the state of a node updates the probabilities of its children and its parents. Then, the newly updated nodes update their children/parents, and so on. You see that each node is now in a particular state, instead of being in a state of uncertainty (the pinkish labels below the node names indicate the current state). You can think of a set of node states as the state of the whole network. This state is known with certainty if you’ve observed the states of each node in the network. The total number of network states is equal to the number of all combinations of node states (usually a very high number for most networks). Each network state has a probability of its own, which is the joint probability over all node states. And the list of all joint probabilities is the joint probability distribution of the network. The names are simply placeholders and can be replaced by particular states — either hypothetically or if the states are actually observed. But here’s the beautiful part. The absence of an arrow between nodes means that the nodes are independent (it’s what you’re essentially assuming about 2 nodes if you don’t put an arrow between them). And this allows you to drop the dependency between those nodes in any further calculations. By not having an arrow between two nodes, you’re basically assuming that the nodes are independent. But in reality they might not be and that would be a flaw of your network. So, the presence/absence of arrows determines the dependency structure of the network. Once you have that, you also need to define the exact dependencies between the nodes with arrows, as well as the prior probabilities of the nodes without arrows. And you’re done: this defines the entire Bayesian network! I’m using the shorthand notation P(Network) to refer to the joint probability distribution over the nodes. And I’m going to use the same notion in the rest of this post. The conditional probabilities are colored in red and the unconditional (prior) probabilities are colored in green. Notice how each node is only conditioned on its parents. This really shortened an otherwise extremely long and difficult to read expression! Hover over here to see what I’m talking about. To summarize, the joint probability distribution of Bayesian networks is simply the product of the probabilities of its nodes. Each probability is conditioned only on the parents of the respective node and nodes that have no parents only have a prior probability. So, we finally come to the interesting part. Imagine you have a network with a specific joint probability distribution, P(Network). As you already know, if the state of one node is observed, this is going to change the probabilities of the states of (some) other nodes in the network. In this section, I’m going to show how to mathematically calculate these new probabilities, called posterior probabilities,. Before any node is observed, each will have a particular prior probability distribution over its states. If a particular node’s state is observed, its probability distribution is changed to 1 for the observed state and 0 for the other states. You’ll remember this particular representation of Bayes’ theorem from my post The Anatomy Of Bayes’ Theorem I linked to in the beginning. More specifically, from the “More intuition about the evidence” section. So, you see that all it takes to calculate the joint posterior distribution of the network is to divide its joint prior distribution by the marginal probability of the observed node. Yes, it’s really that simple! And if you’ve observed the states of multiple nodes, you simply condition the full joint distribution on all observed nodes. On the right-hand side of the equation you will divide by the joint distribution of the observed nodes. I’m going to borrow an example from The Anatomy Of Bayes’ Theorem post for this section. 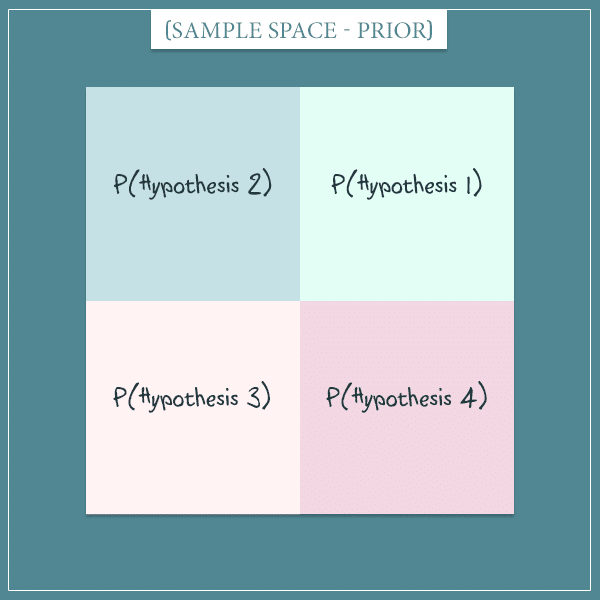 Each of the 4 squares represents one of the hypotheses and all squares have the same area (because we said they have equal prior probabilities). So, each hypothesis has a probability of 1/4. In other words, you now know that that part of the sample space is actually the world you’re living in: the only parts of the old sample space that are consistent with the observation. 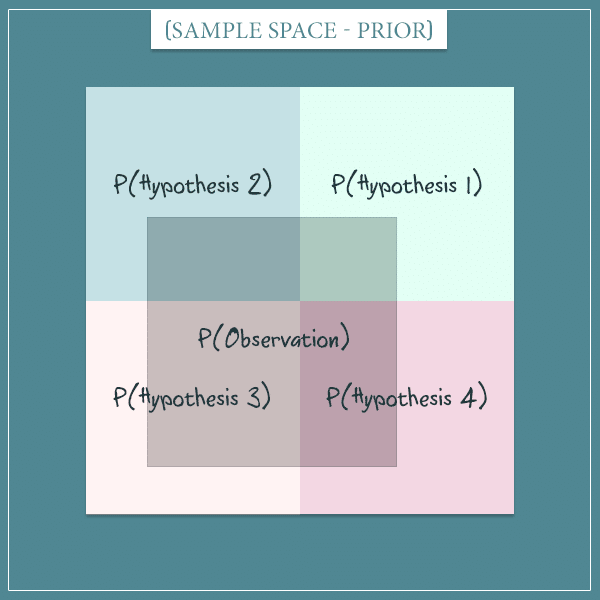 This new sample space represents the posterior probability distribution over the 4 hypotheses. Notice how their probabilities have changed and they’re no longer equally probable. This is because some of them were more consistent with the observation than others. This may still sound a little abstract, but I just wanted to give a quick reminder of how you update probabilities with Bayes’ theorem after new observations. In the next section, I’m going to show an application to a specific example that should make everything I’ve talked about so far much clearer. This was actually the very first example I gave in the previous post. When it rains, the dog tends to bark at the window. And when the dog barks, the cat tends to hide under the couch. 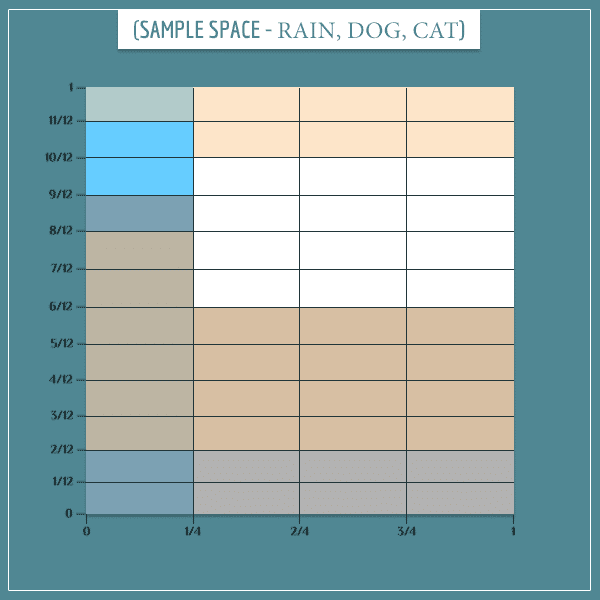 Notice how the blue area (representing rain) covers 1/4 of the sample space. In the same manner, you can calculate the remaining probabilities from the table. 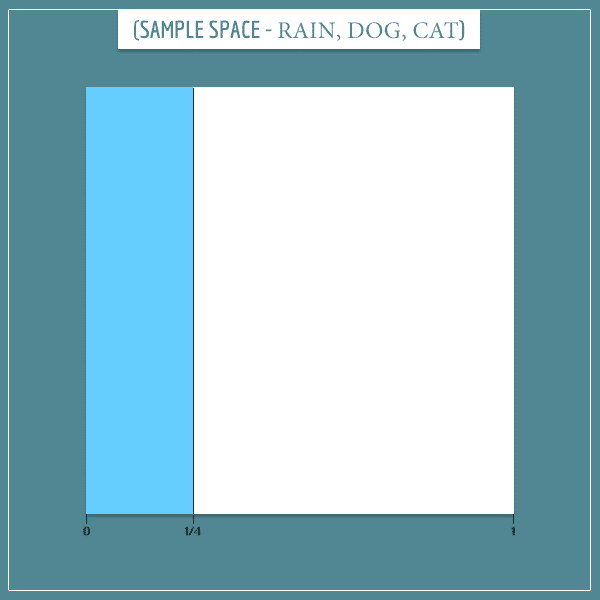 Can we superimpose it on the same sample space? Yes, we can. Notice the beige colored rectangles representing the “Cat hides = True” event. 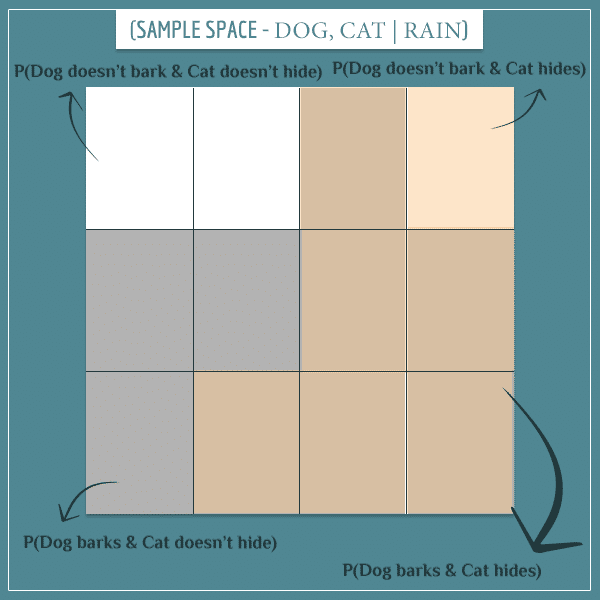 I’ve carefully colored all rectangles so that this 3-way joint sample space doesn’t contradict any of the probability tables. Can you see which of these 12 rectangles corresponds to which of the 12 rectangles from the left-most column from the prior sample space? Take some time to compare the two. 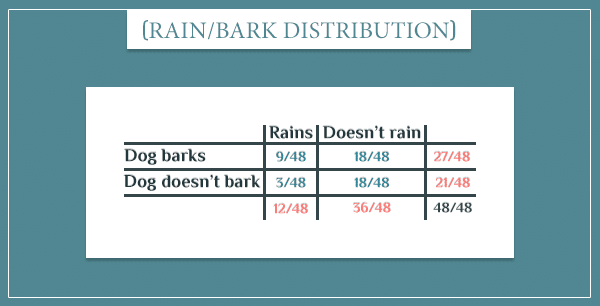 Remember, the prior probability P(Dog barks) was 27/48 (about 0.56). Which is also higher than the prior 25/48 ≈ 0.52. 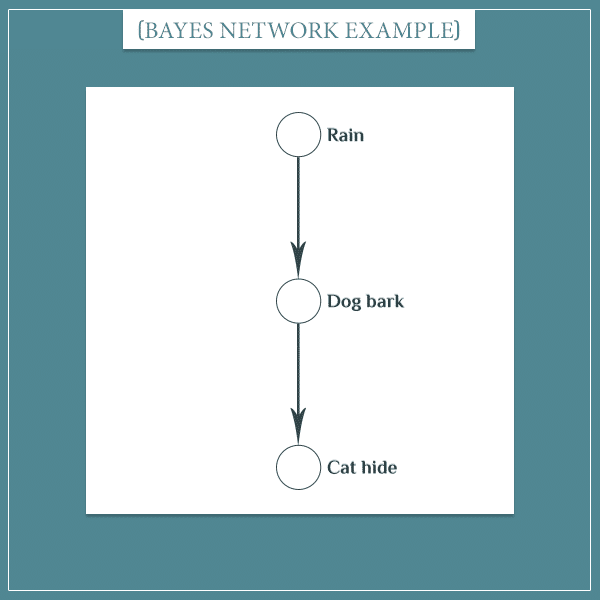 To calculate the posterior probability distribution of Bayesian networks, you divide the prior probability distribution by the probability of the observed event(s). The theory is as simple as that. I tried to give the intuition behind this calculation by visually showing how the sample space changes after a particular observation. But you obviously don’t have to draw sample spaces every time you want to update the probability distribution of a Bayesian network. In practice, you just apply the formula. 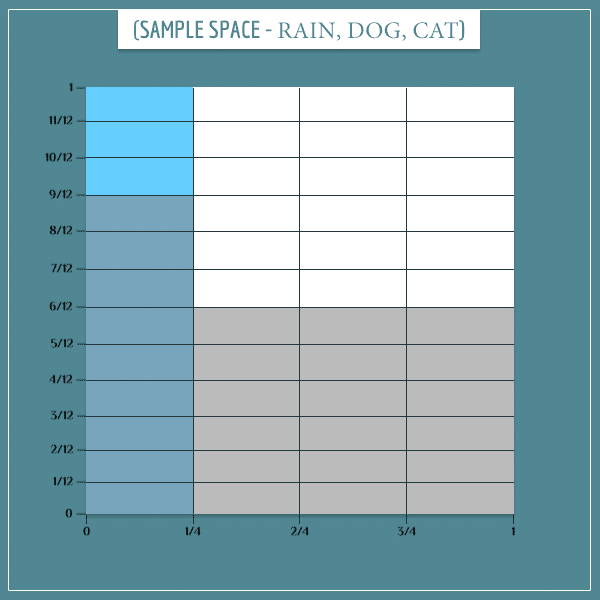 Take a look at the prior sample space again. As expected, the result is the same! 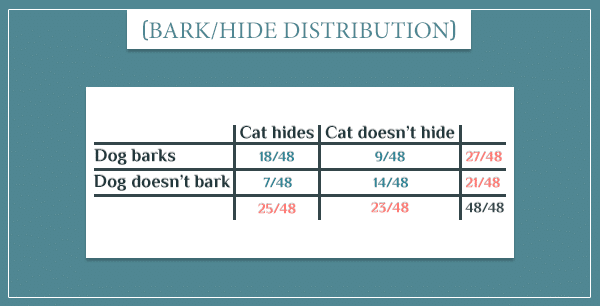 To calculate a specific event’s posterior probability, like P(Dog barks | Cat hides), you simply calculate the marginal probability of that event from the full posterior distribution. In practice, things aren’t always as smooth. For more complex networks, calculating the evidence term (the probability of the event(s) you’re conditioning on) or the marginal probability of individual events can be a mathematical challenge. These more challenging cases are topics for future posts. 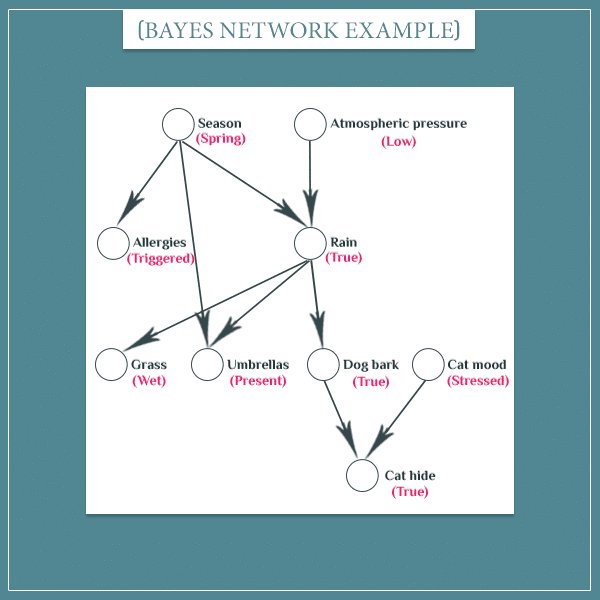 In this post, I gave the mathematical intuition behind Bayesian networks which I had introduced in Part 1. Whether you’re making future predictions or inferences about possible explanations of observations, all you need to do to calculate the posterior distribution of the network is to condition it on the observed nodes. Which simply means to divide the prior joint probability distribution of the network by the joint probability of the observed states. As I mentioned at the end of the last section, in practice many Bayesian belief networks are too complex and there is no exact mathematical solution for their posterior distributions. In such cases, people use different numerical methods to get an approximate solution. These are relatively advanced topics which I plan to cover in future posts. But you don’t have to worry about them for now. 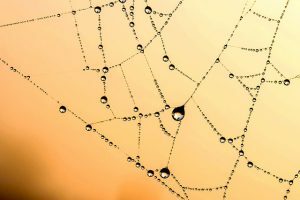 If you feel comfortable with the concepts and methods I introduced in these two posts, you will be able to build simple networks and calculate probabilities with them. And if you have a programming background, you will probably even be able to write your own simple networks to make calculations faster. 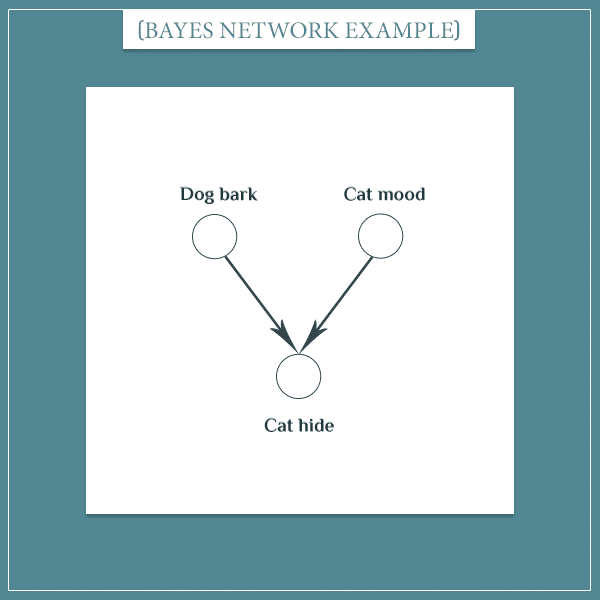 In some of my next posts, I’m going to show applications of Bayesian belief networks to some real-world problems. I think this will give even better intuition on how useful this tool really is. One topic that I wanted to cover in this post, but didn’t, was the concept of conditional dependence and independence between nodes. In short, two nodes that were otherwise dependent can become independent if a particular third node’s state is observed. Similarly, nodes that were otherwise independent can become dependent, again after observing a particular third node. The conditional (in)dependence between nodes, given another node, depends on the particular dependency structure (the arrows) between the nodes in question. Conditional (in)dependence is a central topic to Bayesian networks, so I certainly don’t want to omit it. However, this post already got long enough that I decided to leave this part for a separate post. In fact, this is going to be the very next post I write. This is from exploiting the dependency structure of the nodes in the graph, as explained in the sub-section The joint probability distribution of a network.